I wanted to do a little Oh La La post today. Suzan from Simply Vintageous did a Paris theme giveaway on her blog. Suzan invited several talented and crafty bloggers to do a giveaway hosted by her on their beautiful handmade Paris themed treasures. I loved this. It was a lot of fun and then when I saw I won one of the giveaways, I was so excited. I mean REALLY EXCITED and you will see why after I share the pictures of my beautiful win. 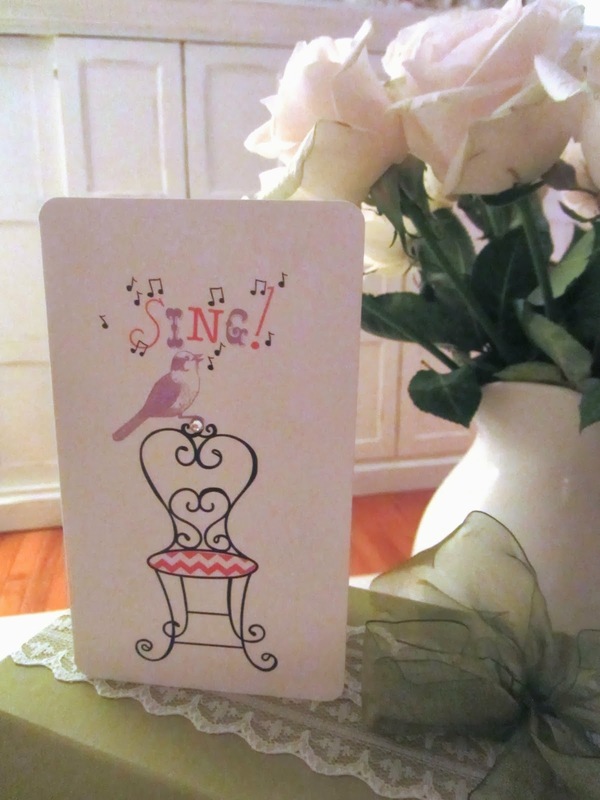 I won the 2nd giveaway on Suzan's blog and it was made by Tuula from Thrifty Rebel. Tuula from Thrify Rebel has a great blog and a wonderful Etsy Site. Tuula is very creative and creates the most beautiful treasures. I was excited to learn I won her give away. This is how the package arrived. Look how pretty she wrapped this package. It is those little details that make things like this so special to receive. Tuula it was almost too gorgeous to open. She added this sweet little card to the package. Not only was the outer wrapping beautiful the inner packaging was too sweet. This was such a fun gift to open. Tuula you are too sweet and what a beautiful presentation. There she is my win. 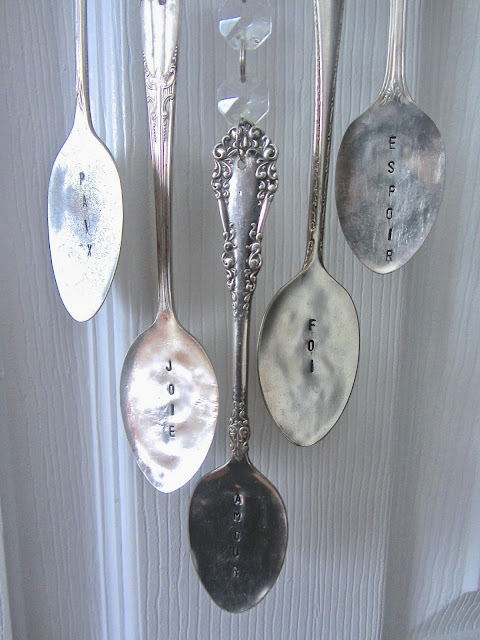 This beautiful wind chime made from old french spoons and Tuula stamped them with french words. 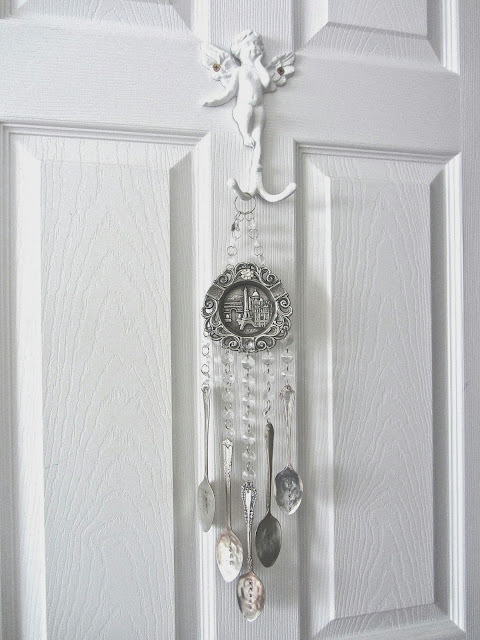 I tried to hang them on a neutral door so you could see the beauty of this chime. Look at those beautiful old vintage spoons. They make the sweetest sounds I cannot wait to hang them out in the garden. These are just beautiful. Tuula a big hug from me. I absolutely love this. Thank you Suzan for hosting such a fun give away. If you have not visited Suzan's blog or Tuula's blog or Etsy site you must jump over there now. Suzan is the furniture whisper and she will leave you in awe of her beautiful furniture transformations and LOL after reading her posts. Tuula you are so talented and I just have to say again I love love love my wind chimes. Your talent and gift to me was so beautiful. OMG! That set of wind chimes is the prettiest I have ever seen! Your new chimes are amazing. What a lovely and creative friend you have :) She's a keeper. Oh your wind chimes are beautiful and I bet they sound wonderful when the wind blows thru them. Congratulation on your terrific win. Congrats on the win...the wind chimes are so pretty!! Oh my goodness....I gotta go to her blog....that is gorgeous!! GORGEOUS! Thanks so much for joining us Kris - Tuula is amazing - absolutely amazing with her creations and I was more than thrilled when she agreed to participate in the giveaways !!! Oh Kris... thank you so much for the lovely shout out. Being a part of Suzan's giveaway was so much fun, and I'm so pleased that your happy with your wind chimes. Enjoy!! Love it--congrats on your win! Beautiful wind chimes. Wish I had seen something like that yesterday at Ethnic Fest. the windchimes are absolutely amazing. you are indeed the very lucky one! i went over to the thrifty rebel, and i think i am going to stay there for awhile. have a wonderful day! So beautiful, Kris. Your home will be the perfect backdrop for your new chimes. I am so happy for you. Its sure fun to win isn't it. I am going to go check them out now. Thanks for sharing. Oh I just want to make sifting through blogs my career! lol. 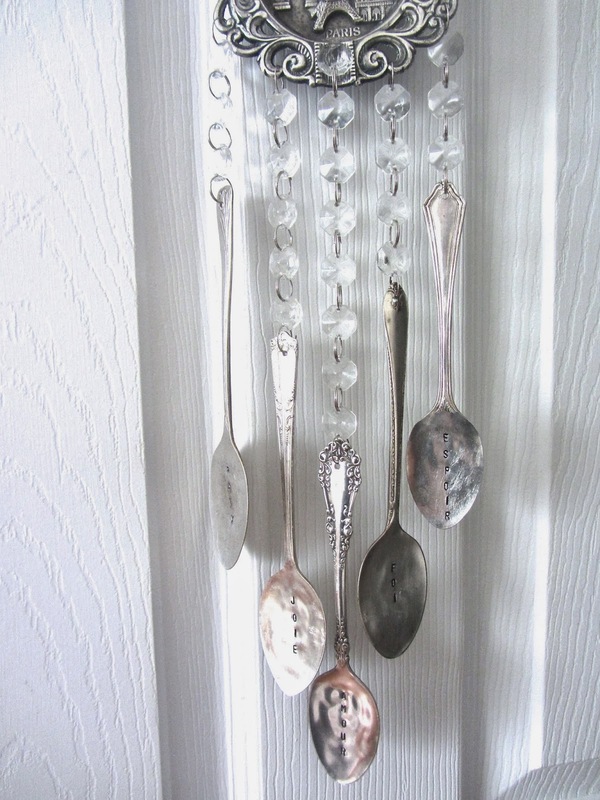 I am in love with that round piece she attached the spoons to. Congratulations on your win. So pretty, and I love the creative way to recycle old spoons!!! Wow Kris, that is gorgeous!!! I won one of the giveaways too. I am so excited to receive it!!! First Part of My Junkin Week End. Junkin week end and some small office change ups. Right In The Middle Of An Ordinary Day!